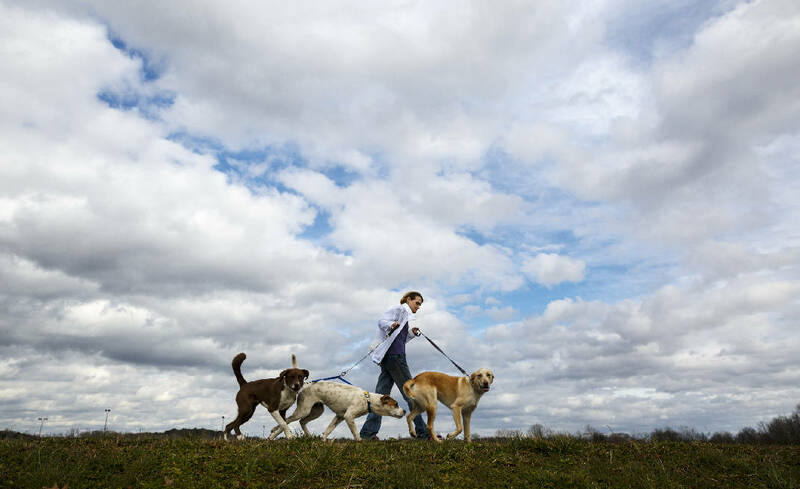 Kathleen Locker walks her dogs on the South Chickamauga Creek Greenway on Sunday, Jan. 31, 2016, in Chattanooga, Tenn. Several new sections of the greenway will be completed in the coming year, linking East Ridge and St. Elmo with the Tennessee Riverwalk. Angela Hicks walks along the South Chickamauga Creek Greenway on Sunday, Jan. 31, 2016, in Chattanooga, Tenn. Several new sections of the greenway will be completed in the coming year, linking East Ridge and St. Elmo with the Tennessee Riverwalk. Within a year, Chattanooga will have completed almost all of a horseshoe-shaped loop of interconnected urban trails stretching some 25 miles — what urban development experts say is one of the most impressive such greenways of any city its size. The project, backed by city and county government and several nonprofit groups, will stretch along the Tennessee Riverwalk from near the Georgia state line in St. Elmo all the way downtown, and then along the Tennessee River almost to Highway 153. From there, it will curve east and south along South Chickamauga Creek to the Camp Jordan recreation area in East Ridge, just south of the intersection of interstates 75 and 24. Supporters say they hope the trails will give many more Chattanoogans access to the string of parks along the Riverwalk, but they have an even bigger goal — to connect people with communities they might not otherwise get to know. "Chattanooga is ahead of the curve in terms of developing its waterfront and developing a very extensive network of trails," said Adrian Benepy, director of city park development for the Trust for Public Land and former head of New York City's parks department. "It is an incredible greenway, pretty unique for the country," said Mike Harrell, president of the South Broad Redevelopment Group. Harrell has spent 10 years working on plans for the area on South Broad that was once the center of the city's heavy industrial district. "The greenway extensions make for healthier residents that have access to daily exercise and better, safer communities by providing more 'eyes on the street,'" said Michael Walton, executive director of green|spaces Chattanooga, a nonprofit group that pushes for sustainable development. It's also good for economic development, some say. The developers of two ambitious projects in the reclaimed industrial area off South Broad Street said the expanded Riverwalk is a major draw for their projects. "This completely connects our community to the aquarium, to downtown, to everywhere without a car, which we feel is important," said Gabe Thomas, development manager for Collier Field, which is breaking ground this month on the first of what will eventually be 61 townhouses and single-family homes behind the old Southern Saddlery Tannery building on South Broad. "This definitely enhances the way developers and users and citizens are going to perceive our property now," said Mike Mallen, a partner in Perimeter Properties, which is redeveloping the huge 141-acre U.S. Pipe site along I-24. Perimeter donated 15 acres so the walkway can cross its property. "You just can't make paths like this on your own," Mallen said, noting that the final southward extension will connect the Riverwalk to 40 miles of trails on Lookout Mountain. But the additions on the eastern end of the horseshoe along South Chickamauga Creek will be important in other ways, supporters of the pathways said. They will bring in neighborhoods in Brainerd and East Ridge now disconnected from the loop. "There are 25,000 people who live within a mile of the South Chickamauga Creek corridor," noted Noel Durant, Chattanooga program director of the Trust for Public Land, a group that for two decades has played a key role in obtaining funds and managing construction of the pathways along the creek. Urban pathways can also be good for existing local businesses, green|spaces' Walton said. "People on foot or on a bike are more likely to stop at a retail location that they originally had not intended to visit than someone in a car," he said. "Just ask the International Towing and Recovery Museum (near the Riverwalk extension on South Broad Street) how excited they are to have the Riverwalk coming so close." The pathway should also boost neighboring real estate values, Benepy said. "In the beginning, there's sometimes a bit of a NIMBY ("not in my back yard") attitude — 'this will bring criminals,'" he said. "But we've never seen an instance where developing a trail has diminished the value of nearby properties." For most local residents, the biggest news is the five-mile-long western extension of the Riverwalk, which currently runs from Ross's Landing to the Chickamauga Dam. The first segment of the new section will open this spring. That will extend the popular walkway to the south and west, ducking under Interstate 24 and across Chattanooga Creek down to the site of the old U.S. Pipe property a block west of South Broad Street. Another expansion will extend the Riverwalk all the way to St. Elmo, piggybacking on a public works storm sewer project along St. Elmo Avenue north of South Broad Street. That will link it up to the Guild Trail, near where Broad Street becomes Cummings Highway, and connect it to some 40 miles of trails that crisscross Lookout Mountain. The final leg on this section of the walkway, known as the Virginia Avenue Greenway, extends through St. Elmo Village, past the Incline Railway and down through St. Elmo itself. In the past, it was little more than an alley between St. Elmo Avenue and Tennessee Avenue, stretching all the way from 38th Street to 54th street, only three blocks from the Georgia state line. Work is underway on the crosswalk across Tennessee Avenue at Ochs Highway. That part of the project should be finished in a couple of months, according to Bert Kuyrkendall, city transportation engineer. The storm sewer project will take longer, but should be completed in 2016, Kuyrkendall said. That project will include reshaping the crosswalk for the greenway across South Broad Street near the Mount Vernon restaurant. There will be a median in the middle of the road to give pedestrians and bicyclists a place to pause when trying to cross the busy street. On the other big leg of the trail, curving from the river along Chickamauga Creek down to East Ridge, work is underway to link the Riverwalk just south of the Tennessee Riverpark with the South Chickamauga Creek greenway levee that runs past Lovell Field. That should be finished this spring. A second section, along Shallowford Road from North Moore Road up to Caine Lane, will be finished later this year. Another two-mile gap should be closed in 2017. That leaves one unfinished piece, a one-mile section that crosses a steep gorge. "It's the hardest bit — it's more of an engineering challenge," said Durant. "You will have to squeeze beneath three railroad bridges so it will be a real technical challenge to build — and very expensive." But supporters of the greenway belt say they have no doubt that work will get done. "It fits the DNA of Chattanooga, it's who we are," said Harrell. "It's part of the natural, authentic beauty of Chattanooga. What a unique opportunity to have it in the neighborhood." Contact reporter Steve Johnson at sjohnson@timesfreepress.com, 423-757-6673, on Twitter @stevejohnsonTFP, and on Facebook, www.facebook.com/noogahealth.